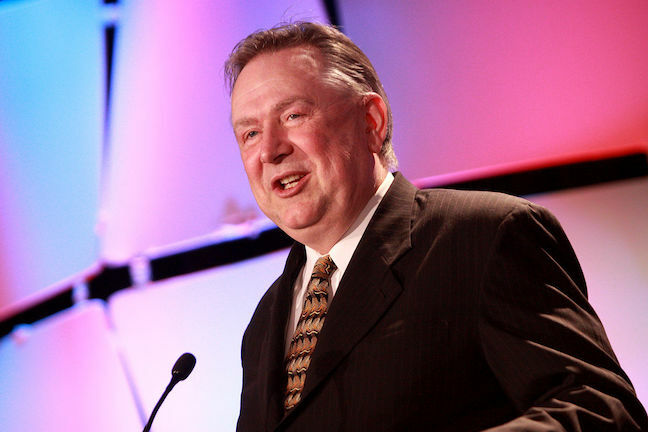 HOUSTON (CN) — Two wealthy businessmen who prosecutors say were duped into giving $1.2 million to former Texas Congressman Steve Stockman’s nonprofits knew they were making illegal payments to Stockman’s campaigns, his defense team said in closing arguments Monday. A federal grand jury returned a 28-count superseding indictment in March 2017, charging Stockman, 61, with fraudulently soliciting $1.2 million in charitable donations to pay for his campaigns and personal expenses. Known as a gun-rights loving, Capitol Hill outsider during his stints in Congress, he made headlines in January 2014 when he walked out of President Barack Obama’s State of the Union speech. He also was known for writing an article for Guns & Ammo magazine in 1995 in which he claimed that President Bill Clinton’s administration had staged the February 1993 raid on the Branch Davidian Christian fundamentalist compound in Waco, to justify banning assault weapons. U.S. District Judge Lee Rosenthal on Monday advised the jury not to read too much into the fact that the government called more than 30 witnesses, including two former Stockman congressional aides who agreed to testify against him after pleading guilty to related charges, while Stockman’s defense team called just two people to the stand. “Do not reach a conclusion on a point because there were more witnesses on one side. The burden never falls on the defendant for calling witnesses or producing evidence,” Rosenthal instructed the jury. Stockman appeared relieved Monday that his trial is almost over. During a morning break, he smiled while chatting with friends and family among the 50 people in the gallery, a marked change from the scowl he maintained throughout the proceedings. Prosecutors stuck to their “follow the money” game plan, bolstering witness testimony with numerous emails, bank statements and check stubs they showed the jury, records they said proved Stockman, an accountant, laundered charitable donations through at least seven bank accounts. The government’s case against Stockman involves two donors: Richard Uihlein, a Chicago businessman who donates millions of dollars to nonprofits that back conservative Republican politicians; and Stanford Rothschild, a Baltimore investment manager, who also donated generously to conservative causes before his death in 2017 at 91. Stockman’s attorney Sean Buckley went on the offensive Monday against Uihlein and Rothschild. “This is a case about why rich mega-donors give to politicians in America and the methods they use to do it. … We should all be concerned there are people like Uihlein and Rothschild, who have more power than you and decide who should be in Congress,” Buckley told the jury. Uihlein testified for the prosecution on March 21 that Stockman persuaded him that the $350,000 he donated to Stockman’s nonprofit in January 2013 would be used to buy and renovate “Freedom House,” a townhome in Washington that Stockman said would be a meeting place and dorm for young Republicans. Prosecutors said that not one dime of the $350,000 went toward any home, despite Stockman’s soliciting Uihlein with a brochure that included pictures of a home. They said Stockman went on a “white-collar crime spree” with Uihlein’s and Rothschild’s donations, paying off loans and credit cards, and paying for dry cleaning, tanning salons and groceries and trips to Disneyland and New Orleans. “He just spent it,” prosecutor Ryan Ellersick told the jury Monday. Stockman blew $20,000 on 500 pop-up Advent books published by his brother, $11,000 on alcohol rehab for a friend, and $40,000 paying people to stake out Texas state Rep. James White in Austin, Ellersick said. According to trial testimony, Stockman saw White as a potential rival in his bid for the U.S. Senate and tried to dig up dirt on White, but found none. Stockman came in second in the Republican primary in March 2014 to incumbent John Cornyn, R-Texas, the Senate majority whip. To deflect attention from Uihlein’s charitable donations — Stockman’s defense team said Uihlein has donated $50 million over the past 9 years — Buckley said Uihlein’s attorneys created the theory that Stockman is a fraudster when FBI agents tried to interview Uihlein about his dealings with Stockman. Buckley said Uihlein clearly knew the $350,000 would go to Stockman’s campaign coffers because he never inquired about Freedom House after he made the tax-deductible donation through his own charity. Buckley also said that Rothschild knew that the $450,000 he donated to Stockman’s charities from 2010 to 2012, with instructions to use it to produce voter education materials, was actually going to fund Stockman’s campaign. The FBI began investigating Stockman after news reports in late 2013 that Stockman’s congressional staffers Thomas Dodd and Jason Posey had filed documents with the Federal Election Commission falsely stating that $7,500 donations they had each made to Stockman’s campaign in February 2013 were from Posey’s father and Dodd’s mother. Both Dodd and Posey testified for the prosecution that they knew the money had come from Uihlein’s $350,000 donation, and that Stockman had asked them each to donate $7,500 to his campaign, which Stockman said was in debt from the 2012 race that got him elected to Congress for the second time. They testified that Stockman cut them checks they used to fund the donations from his sham nonprofit’s bank account. They each said that Stockman had told them that if anybody found out, he would take the fall. Dodd pleaded guilty to mail and wire fraud and lying to the Federal Election Commission in March 2017. Posey pleaded guilty last October to mail and wire fraud and money laundering. Stockman’s defense attorney questioned Posey’s and Dodd’s admissions on Monday. “It would immediately draw the Federal Election Commission’s attention that the money came from staffers. Stockman had all sorts of other people who were not staffers. It makes no sense that he would pick Dodd and Posey to do it,” Buckley said. But prosecutor Melissa Annis wrapped up her closing statements Monday by reminding jurors of the extensive paper trail the government showed to back its claims about the campaign contributions. “If you think of Dodd’s and Posey’s testimony and the documents to corroborate them, their story rings true. Don’t worry about why Stockman did it; whether it was logical does not matter. What matters is that he did it,” she said. Stockman is charged with mail and wire fraud, conspiracy, making false statements to the Federal Election Commission, money laundering and filing a false tax return. If convicted of all charges he could be sentenced to up to life in prison.